"Sesija Kruga 99 u nedjelju, 22.10.17. godine održana je na temu i sa uvodničarima kako je prethodno i najavljeno. Međutim, ovom prilikom je prije prelaska na temu redovne sesije izvršena je inauguracija na čast našeg člana Doc. 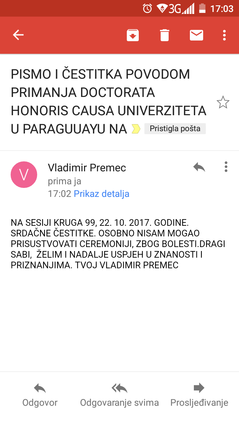 Dr. Sabahudina Hadžialića u zvanje „Počasnog doktora – Honoris Causa“ . U kraćem izlaganju članovima Kruga 99 se obratio i gospodin Peter Tase. Gost Kruga 99 je bio i Elnur A. Guliyev, Šef diplomatske misije Republike Azerbejdžan u Bosni i Hercegovini." 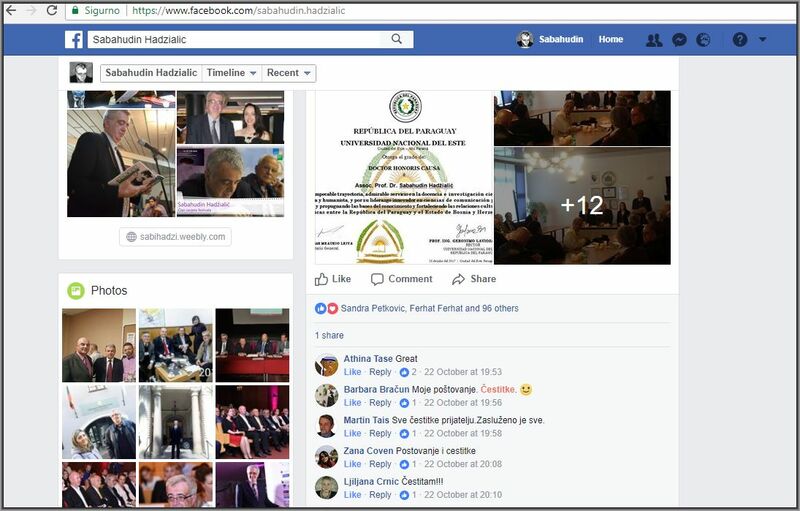 Your Excellency Mr. President of Association of Independent Intellectuals Circle 99; Your Excellency Councelor of Embassy of the Republic of Azerbaijan in Belgrade, Mr. Elnur A. Guliyev; Assoc. Prof. Dr. Sabahudin Hadžialić. It is a great honor for me to be here today and I am delighted to say a few words on the bilateral relations between Bosnia and Herzegovina and the Republic of Paraguay, thanks to the hard work of Associate Prof. Dr. Hadžialić. All of this initiative started in early 2013 when both of us started to bring these two countries together and the Chancellor of National University of the East, Prof. Dr. Victor Britez Chamorro is the first prominent Paraguayan public servant to visit Travnik, Sarajevo, Mostar in December 2014. In April 2015 Prof. Hadzialic was invited from the Government of Paraguay to deliver three Keynote Lectures in the National University of the East, Technical University of Commerce and Development and in the Autonomous University of Asuncion. On this visit the public opinion in Paraguay became familiar about Bosnia and Herzegovina and Assoc. 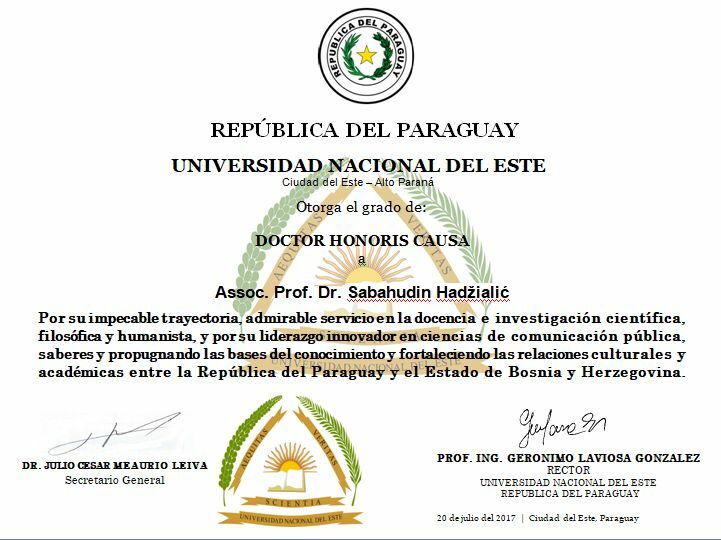 Prof. Dr. Sabahudin Hadžialić widened, strengthened his knowledge and research on Paraguayan studies. Today this cooperation among universities of the two countries continues to thrive and progress. Assoc. Prof. Dr. Sabahudin Hadžialić has provided guidance in establishing Academic cooperation between UNE and IUT as well as the University of East Sarajevo. In addition to all of these initiatives Prof. Hadzialic is also focused to introduce Academic institutions of Bosnia and Herzegovina and the Republic of Azerbaijan; in the same vein I would like to express my gratitude to the President of the Republic of Azerbaijan, H. E. Mr. Ilham Aliyev, for inviting me to currently conduct post graduate research in Baku (under an academic program of Azerbaijan International Development Agency). Assoc. Prof. Dr. Hadžialić is the best cultural ambassador of Bosnia and Herzegovina in the world. With his books, papers, novels, poems, satires and essays, Prof. Hadžialić has strengthened Democratic Institutions in the Balkans, brought together many distinguished poets (from 30 countries) in Sarajevo and today he represents the very best of Bosnia and Herzegovina and its network of scholarship, high standards of teaching in various universities of Europe (Italy and Lithuania). His genuine talent, distinguished leadership in public service, university administration, teaching, cultural diplomacy and in educating the young generation of Europe and Bosnia and Herzegovina. He is an example for many other European intellectuals, who is living in the heart of Europe, not being a member of any political party. Prof. Hadžialić is the symbol of unity and patriotism in Europe and in Latin America. For all of these remarkable efforts and many more; Chancellor Prof. Ing. 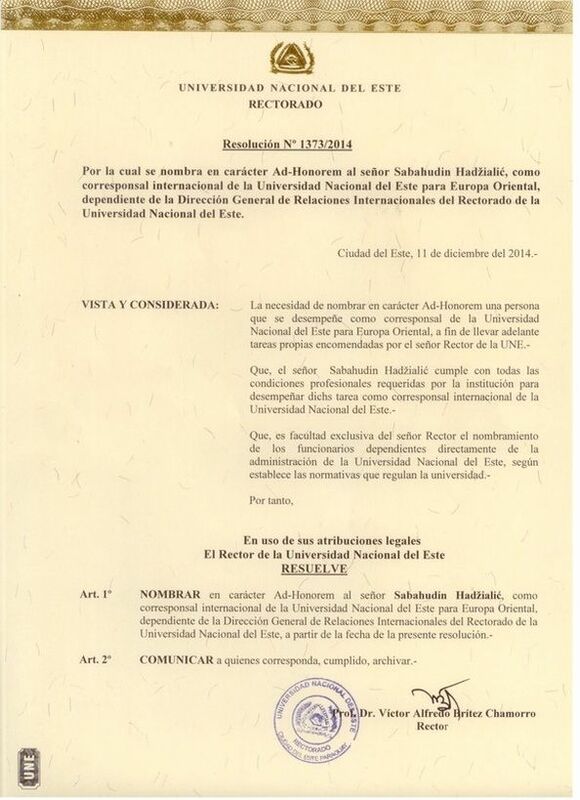 Geronimo Laviosa Gonzalez and Senate of UNE, have decided to award to him the title of Doctor Honoris Causa. Zahvaljujem se na čestitkama Akademiku, Prof. emeritusu, Prof. Dr. Vladimiru Premecu, kao i in vivo čestitkama svim kolegama i prijateljima iz Asocijacije nezavisnih intelektualaca "Krug 99", predsjedniku Adilu Kulenoviću, Jovanu Divjaku (na telefonskom pozivu), Prof.dr. Hidajetu Repovcu, Prof.dr. 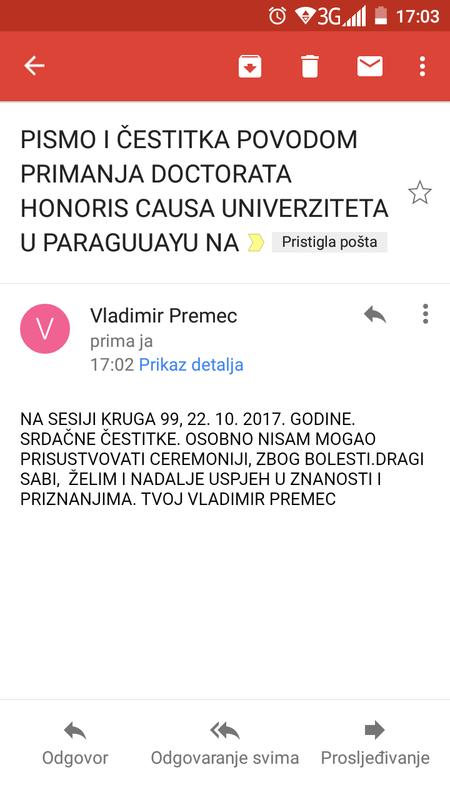 Ismetu Dizdareviću, Prof. dr. Ladi Sadiković, Doc.dr. Sanku Panduru, Dr. Slavenu Kovačeviću, Ratku Orozoviću, Željku Majstoroviću, Martinu Taisu i kolegama profesorima (Doc.dr. 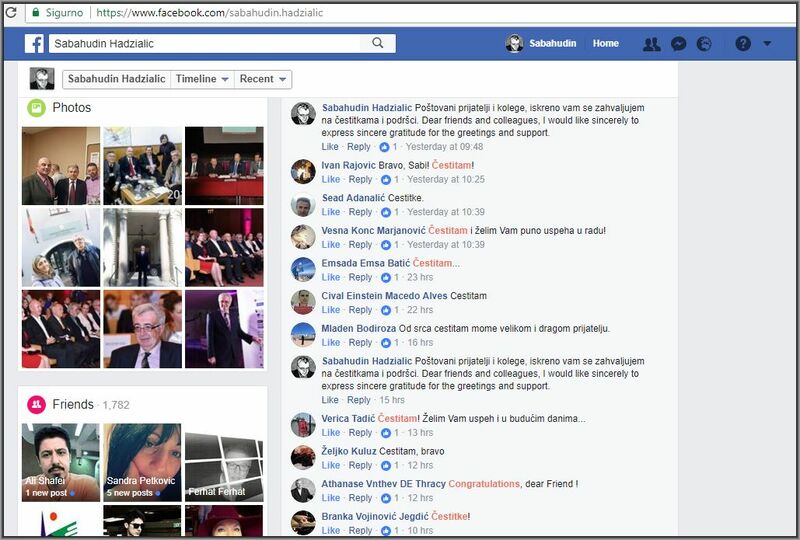 Saša Đekić, Prof. dr. Hristo Petreski, Prof. Dr. habitus Dorota Sieminiecka), književnicima (Athanase Vntshev de Tracy, Ali F. Bilir, Nihadu Mesiću, Mariji Feketi Sullivan, Ljiljani Crnić, Ivanu Rajoviću, Žarku Mileniću, Vesni Konc Marjanović, Zlati Žunić, Aleksandar Čotrić; Sanja R. Petrović, Barbara Bračun, Radmilo Radovanović, Ekrem Macić, Mexhid Mehmeti, Jasmina Hanjalić, Mišo L. Korać, ), likovnim umjetnicima (Ismail Kera, Hule Hanušić), novinarima (Tariku Heliću, Ljiljani Simić, Kenan Kavazović, Nermini Omerbegović, Enisi Skenderagić, Vanji Iličić, Azri Karalić, a posebno urednici RTV Bugojno, Eneidi Alibegović - na telefonskom pozivu), ali i drugim prijateljima (Akademik, Prof. dr. Mladen Bodiroža, Dragan Stojković) i/ili ostalim, iskrenim poznanicima i saradnicima koji su mi čestitali email dopisom i/ili preko društvenih mreža. 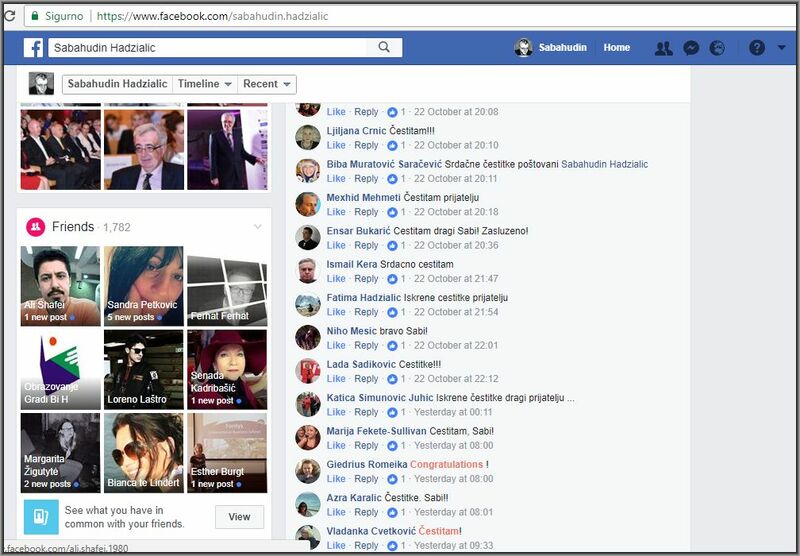 Svoju zahvalnost izražavam na čestitkama od strane Dekana Kaunas fakulteta iz Vilnius univerziteta, Litvanija, Doc.dr. Kęstutis Driaunys, kolegama Prof. dr. Jadvyga Krūminienė, Doc.dr. Aiste Urboniene, Doc. dr. Vilma Tamuliene i Dr. Giedrius Romeika.